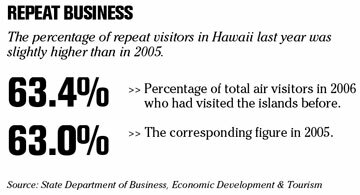 A new study by Chaminade University expresses "cautious confidence" over Hawaii's climate for startups. The "Hogan Entrepreneurial Index -- 2007" surveyed 30 local individuals, including venture capitalists, service providers and entrepreneurs. The caution expressed by the respondents pertained mostly to rising housing prices, a shortage of skilled workers, the lack of venture capital funding and a risk-averse culture. The Hogan Entrepreneurial Program, an honors course track at Chaminade University, launched the study in collaboration with 3Point Consulting LLC. The Index is viewable on the Chaminade website at www.chaminade.edu/academics/hogan. NEW YORK » Eastman Kodak Co. is cutting 3,000 more jobs this year as the picture-taking pioneer wraps up its wrenching transformation into a digital-imaging company focused on consumer photography and commercial printing. By year-end, its work force will slip below 30,000, less than half what it was just three years ago. On top of 27,000 layoffs already targeted, Kodak said yesterday it is reducing its payroll even further to accommodate the $2.35 billion sale in January of its health-imaging unit and its costly foray this week into a high-margin inkjet-printer market dominated by Hewlett Packard Co.
"The dream was that we would wake up in 2008 with the digital company that we want to have. We're still right on that track," Chief Executive Antonio Perez said. WASHINGTON » Rates on 30-year mortgages fell for the first time since early December as lower-than-expected job growth eased worries in financial markets about inflation. Mortgage giant Freddie Mac reported yesterday that 30-year, fixed-rate mortgages averaged 6.28 percent this week, down from 6.34 percent last week. The small decline was the first drop in rates since Dec. 7 when 30-year mortgages had fallen to 6.11 percent. Rates on 15-year, fixed-rate mortgages, a popular choice for refinancing, fell to 6.02 percent, down from 6.06 percent last week. Five-year adjustable rate mortgages fell to 6.02 percent, down from 6.04 percent last week. One-year ARMs dipped to 5.49 percent, down from 5.54 percent last week. RICHMOND, Va. » Circuit City Stores Inc., the nation's No. 2 consumer electronics retailer, said yesterday it plans to close seven domestic stores, a Kentucky distribution center and 62 company-owned stores in Canada to cut costs and improve its financial performance. Circuit City would not identify the stores to be closed because company officials were in the process of notifying employees. The stores will be closed Monday, then reopen Wednesday for clearance sales, spokesman Bill Cimino said. The company could not immediately determine the exact number of employees who would lose their jobs. The distribution center employs 12 people, and each of the seven stores slated for closing employs about 30 full-time and part-time workers, Cimino said. BETHSDA, Md. » Marriott International Inc., the biggest U.S. hotel operator, said fourth-quarter earnings fell less than analysts anticipated on an increase in demand for timeshares and hotel rooms. Net income declined 7 percent to $220 million, or 52 cents a share, from $237 million, or 54 cents, a year earlier, the company said in a statement yesterday. Nineteen analysts in a Bloomberg survey estimated profit of 49 cents a share. A drop in revenue from four synthetic-fuel plants the Bethesda, Maryland- based company bought in 2001 pushed profit lower. 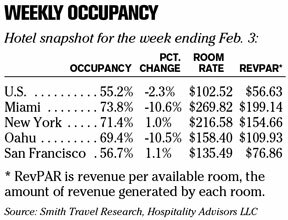 Lodging revenue rose 8 percent to $3.78 billion, with timeshares growing 27 percent to $526 million. The company is expanding in Hawaii and the Caribbean with new timeshare properties. Overall revenue increased 6 percent to $3.86 billion. DENVER » Colorado regulators have approved a $60 million solar-energy facility in the southern part of the state, believed to be the largest such project in the country. The plant, which will be located north of Alamosa in the San Luis Valley, will generate up to 8 megawatts of electricity, enough to power 1,650 homes. Baltimore-based SunEdison LLC will operate the site and Minneapolis-based Xcel Energy will purchase the power. The plant's current plans call for photovoltaic panels that directly convert sunlight to electricity. IRVINE, Calif. » Gateway Inc. said yesterday it moved to a profit in the fourth quarter after a tax benefit pushed the struggling computer maker into the black. The company reported net income of $8.8 million, or 2 cents per share. The result included a tax gain of $11.8 million. Last year, Gateway posted a loss of $20.9 million, or 5 cents per share. Revenue declined 9 percent to $1.02 billion from $1.12 billion last yearn. Unit sales of personal computers fell 5 percent to 1.29 million, giving the company a 6.6 percent share of the U.S. market. CHICAGO » Tribune Co. rode cost controls and non- operating gains to an 81 percent rise in fourth-quarter profits but said yesterday that advertising, circulation and total revenues all declined excluding the benefit of an extra week in the period. The newspaper and TV-station owner said the results, including a net profit of $239.1 million, included one-time gains unrelated to operations that padded the bottom line by $69 million. Revenue grew 5.4 percent over the previous yearto $1.47 billion.